Tension between Likud MKs and prime minister set to deepen as letter is sent to Central Committee Chairman Danny Danon urging end to talks. Members of Likud are calling for the party to convene as soon as possible to discuss how to call off the present peace negotiations, according to a report by Maariv. The majority of the Central Committee have sent a letter to Central Committee Chairman MK Danny Danon, requesting a meeting as soon as possible. Additionally, the report said that 20% of Likud committee members turned to the office of MK Ze'ev Elkin for the same reason. “These days the Israeli government, headed by Likud, leads the negotiations,” members of the Central Committee wrote. “These negotiations are conducted in secret. But according to various reports, there is a major concern that there are concessions being offered by Israel that are totally contrary to Likud’s principles,” the letter went on to state. Talks between Israel and the Palestinian Authority were kick started in August by US Secretary of State John Kerry with meetings being held in secret in Washington and Jerusalem. A growing number of MKs in the Likud have criticized the prime minister for releasing palestinian terrorists from Israeli prisons as a gesture to get talks under way. Following the slaying of two IDF soldiers in three days, dozens of Knesset members, including deputy government ministers, have signed a letter calling on Prime Minister Binyamin Netanyahu to cancel all planned releases of terrorist prisoners. Prime Minister, Binyamin Netanyahu has found himself increasingly entangled with many MKs in the party. Deputy Defense Minister Danny Danon recently embarrassed Netanyahu in an interview with the Times of Israel saying that the government was not truly committed to a two-state solution and that the prime minister only renewed the process because he knew that an agreement would never be reached with the Palestinians. Earlier this week in an article published in the New York Times, Danon also called for the Oslo Accords to be annulled. "The government of Israel must admit that we made a mistake and declare that the Oslo process has failed," Danon wrote. He continued, "only by officially annulling the Oslo Accords will we have the opportunity to rethink the existing paradigm and hopefully lay the foundations for a more realistic modus vivendi between the Jews and Arabs of this region." 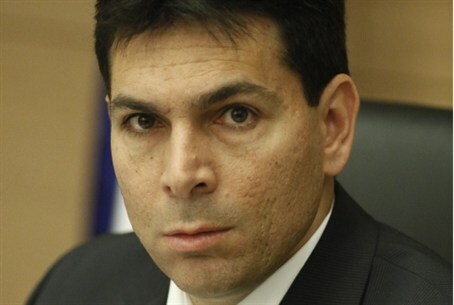 Tension between Danon and the prime minister was also strained last month when Netanyahu reprimanded Danon for calling for anyone seeking an interim agreement with the Palestinian Authority to be removed from the Likud Party. Another relationship which has seen rosier days, is that between the prime minister and Deputy Foreign Minister Ze'ev Elkin, another fierce critic of ongoing negotiations with the PA. Instead, Elkin will fly to New York next week on a separate flight.